I have always admired ‘morning people’ because I have never really been one. I’m not a sleep-all-day type either, but I do not have a magical internal clock that rouses me, energetic and alert, every morning. In fact, the snooze button gets a lot of use and I have been known to spend far too much on really, really comfortable bed sheets. But sometimes on the weekend I cannot help but purposely get up early before everyone else because I love the quiet stillness of the house in the early morning. I like to get up, putter around, make some tea, and catch up on some online reading — nothing too strenuous. Not surprisingly, I also capitalize on such quiet, solo mornings by cooking, blogging and taking pictures – thank goodness for the huge kitchen window and the moody softness of morning light. So much of life is spent hurrying, worrying and just trying to get up and out the door. A weekend morning of solitude can be a welcome reprieve after (or before) a hectic work week. In the summer, early mornings are nice to spend outside before the heat hits, but now that fall has really arrived, the coziness of foggy mornings keeps me inside and gets me thinking of something warm and sustaining for breakfast. Butter a 8×8 inch baking dish. Add oats and spices. 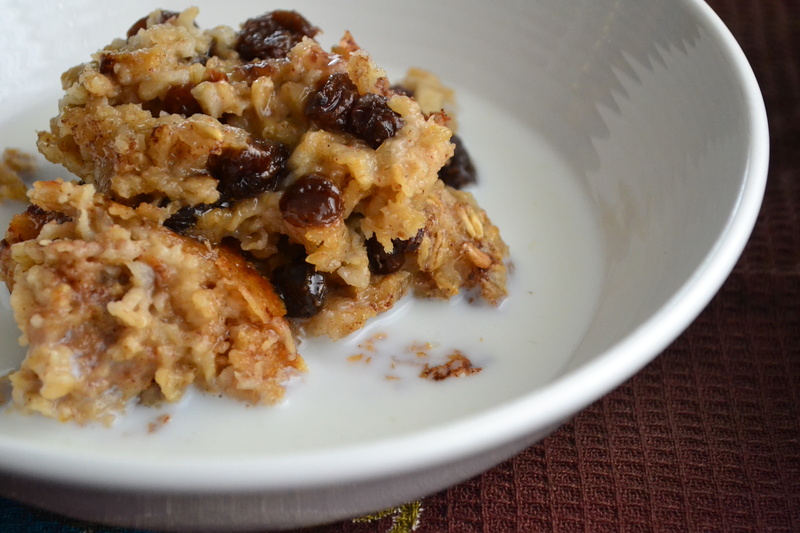 Top with raisins. Stir together milk and vanilla and pour over oats. Bake for 40 minutes until tender and browned. Serve immediately with milk and more maple syrup or brown sugar as desired.